¡Hi! 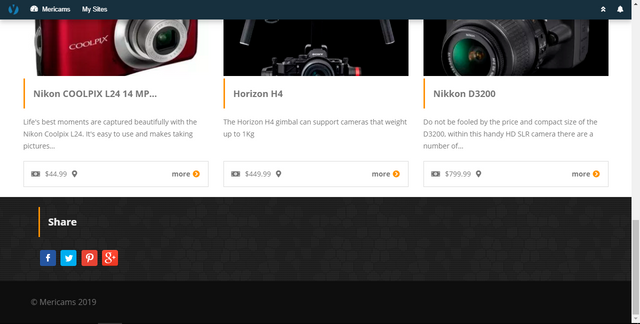 this week we will show you how to create a marketplace site of cameras and photography services with YCLAS. First log your mail and web domain at YCLAS. We will send you a confirmation email, click the confirm button or the link below it to continue, then you will receive another email where we announce your site is alive. *Important* In that email, we will give you the access password to your admin panel. We will not save your password in our records, so please don't lose it. We recommend you to change it after login in for the first time. If you click the link in the second email (http://yourwebsite.yclas.com) you will be able to take a first look of your website. It will look like this. To manage your website, you can click Manage at Classified “your website name”. 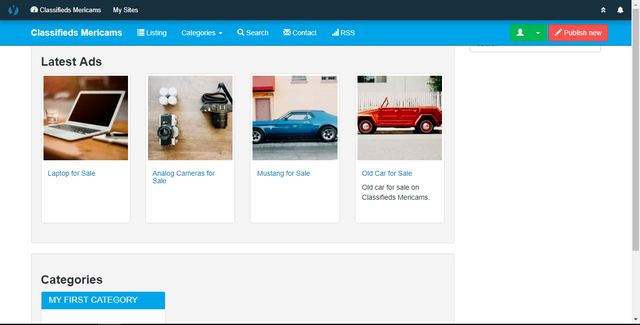 You will see your admin panel, this is where you can control almost everything in your classifieds site. 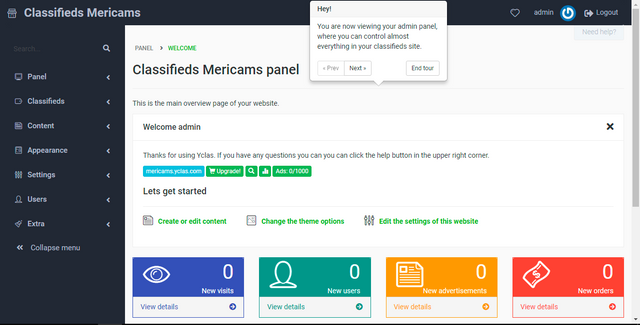 Yclas automatically offers you a tour of our admin interface when you enter to the admin section. Now you can go to Appearance > Themes and you will see the themes we offer to make your work easier (e.g. I will use the Yummo Theme). 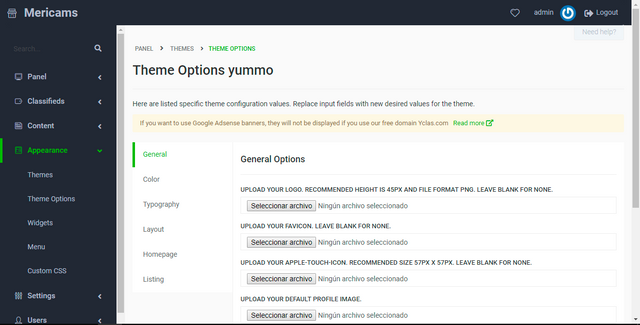 When you pick a theme the page will take you to the Theme Options where you can edit your theme template. At General Options upload your site Logo, Favicon and Apple-Touch-Icon (e.g. I will use a logo and Favicon I've created). Once updated, the site will look like this. At Color Options you can manage the colors your site going to have (e.g. I will use a color palette I've created). At Typography Options select the Body Font you want for your site (e.g. I will use Open Sans). At Layout Options you will find a few more options to edit your site appearance (e.g. I will disable the category counter badge and show a bannergroup above the footer of the page, also I will write what I want to show on the title and subtitle of the bannergroup). At Homepage Options you can set the number of ADS to be displayed on the home slider (e.g. I will put 12), and you can place a header (allows HTML) (e.g. I will link an image). Once updated, the site will look like this. At Listing Options, you can set a few more options as Infinite Scroll or Display Slider In Listing (e.g. I will set the second option to show on every listing the location of ad). 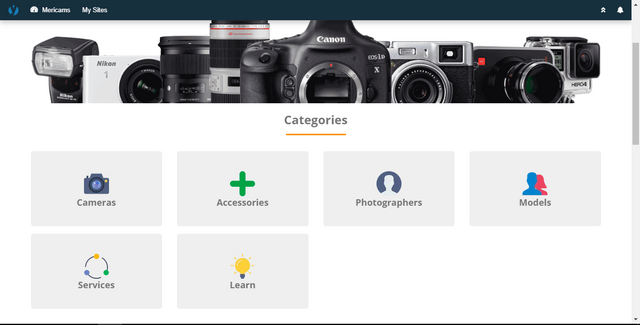 At Classifieds > Categories you can use the Quick Creator tool to create all the categories you want to display on your site. 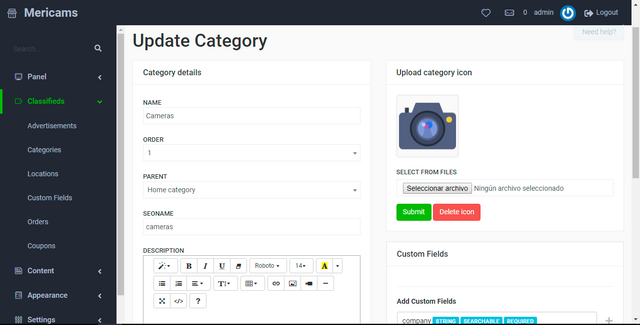 If you click on the edit button at the right next to any category you've created, you can update the information of that category as Name, Parent, Description, even upload a Category Icon (e.g. I will upload one of mine). You will have something like this. And your website will look like this. At Custom Fields section you can set the fields that must be filled when an ad is being created in any category. Your site is ready to run ads now. At Appearance > Widgets you can add to your page a variety of available widgets we offer and select where to locate them (e.g. I will create a share button). 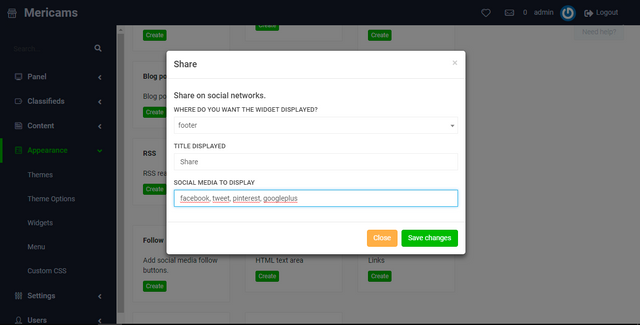 First select where will be located your widget, then write what you want to display as title and, for last, write the social media icons you want to display (e.g. facebook, tweet, pinterest, googleplus). Click Here to find all the words you need/have to use for the different social media sites. At Menu you can create an item to show on the sidebar (e.g. I'll put Home, Search and Contact buttons). Once updated, the site will look like this. At Settings > Plugins, you can activate the Blog and FAQ system, which ones can be configured at Content section. Now, you can add all the extra adjustment you want to your marketplace site. 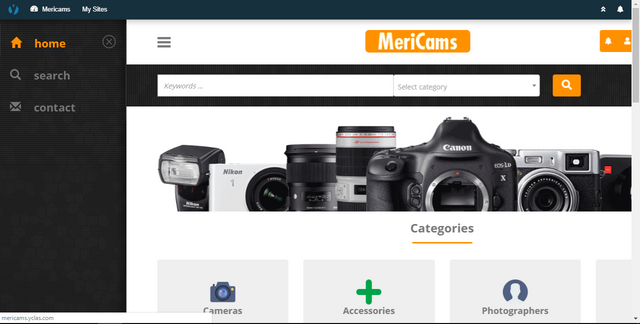 Click Here to visit MeriCams (note: this is a sample marketplace, it's not a real commerce website).